This covers many products but generally, you choose between hard tails and full suspension. Hard tail bikes have rigid frames and a suspension front fork whereas a full suspension bike incorporates rear suspension. Mountain bikes are versatile and can handle off road conditions from rough rocky conditions to less challenging towpaths and bridleways. Hard tails are more responsive with the front suspension forks helping absorb the bumps with all the power pushed through the pedals transferring into momentum. Full suspension bikes are designed to handle more aggressive downhill conditions by adsorbing impacts whilst maintaining traction but on the flat some of your power will be lost due to the rear suspension. We’ve been creating great children’s bikes for years. As a parent, it’s the name you know and can trust, with our design and technical expertise your child couldn’t be in better hands. Every bike has built-in safety and lots of play value, it’s our care and attention to these details that makes our bikes stand out from the crowd. 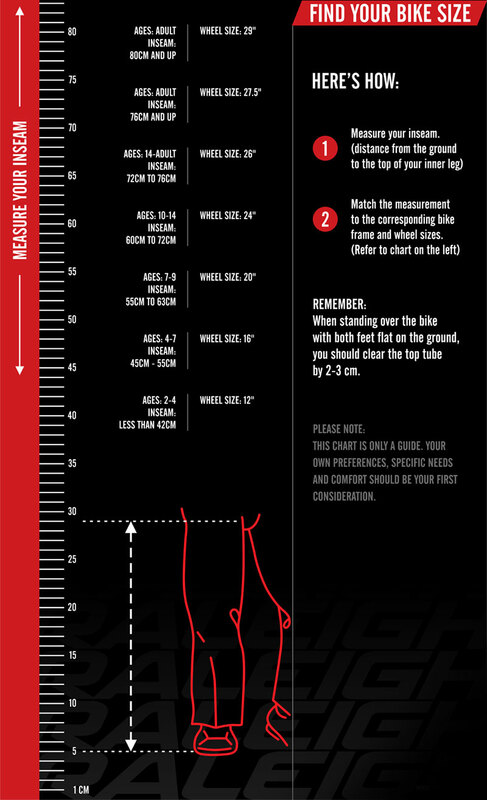 The sizing chart below gives a guide to frame sizes against inside leg measurements. The correct way to measure your inside leg is from your crotch to the floor making sure that your feet are flat on the ground. You must be sure what size bicycle you require before purchasing. This is only a guideline, and we recommend that you visit your local Raleigh dealer to try the bike for size. If assembling a bike yourself, for your safety please ensure you read all the assembly instructions carefully and carry out a final check before riding your bike i.e. check all nuts and bolts are tight + add on’s such as stunt pegs etc are fully tightened and the brakes are adjusted. Click here to download assembly instructions.